To celebrate my favorite season, I have an Autumn giveaway, be the first to make a purchase and this little fabric covered Autumn box is yours! 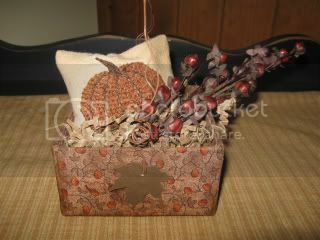 I covered a paper mache box with this adorable Fall fabric, I grunged it up a bit, attached a rusty wire handle with 2 hanging rusty leaves. 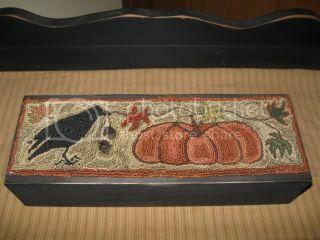 I stitched up a little pumpkin on flour cloth, dyed it up and filled it with crushed black walnut shells. These are my new favorite berries for the year. I am a berry freak and just found these the other day at a local Prim shop. I put some brown basket shred in the box too. The box measures 3 3/4"x 3 3/4"x 2"" tall. It looks so cute setting on my shelf as it will look cute on your's too! 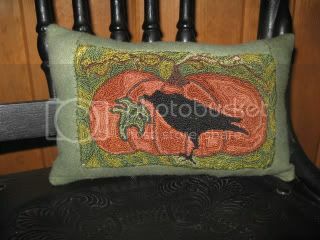 This needle punch Autumn pillow was designed and punched by me on weavers cloth using dmc and Valdani thread. I have a black crow with an autumn leaf in his beak in front of a big old pumpkin. The needle punch design was hand sewn to primitive green wool strips then I machined the back with matching wool. It was filled with ployfil and the measurements are about 9 1/2" long x 5 1/2" wide. 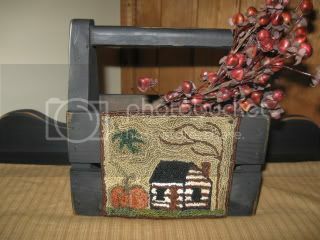 A sweet pillow to sit on a small chair or prop it up in a cupboard with your Autumn displays. This Autumn needle punch box has an old crow with some acorns hanging from his beak, a plump pumpkin, and some scattered fall leaves. I designed and punched this piece on coffee dyed weavers cloth using Valdani and dmc thread. I attached it to the top of the box with an acid free spray adhesive. 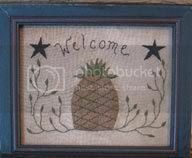 The box was painted black and distressed on the outside, I left the inside as is. This Autumn box will look great sitting on a table or you can turn it on its side and put it in a cupboard for a different view. The box measures 4 1/2"x11 1/2" long and 2 1/2"tall.